BLACKBERRY BANQUET SAVES THE DAY! 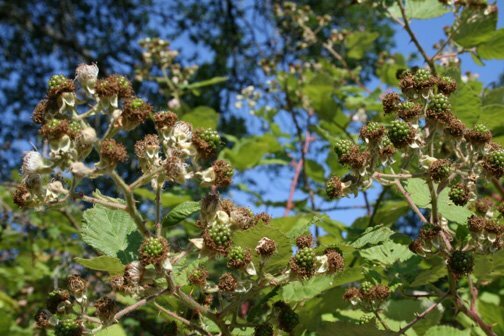 Last week I read a delightful blog post on Family Briefs: A Few Briefs Along the Parenting Journey sharing how the reading of Blackberry Banquet actually saved a blackberry bush from sure death (a near tragedy, for sure). Apparently, the encroaching bush was merely doing what all blackberry bushes do, taking over everything around it, which included the blogger’s family garden. Mom was prepared to get rid of the bush, but through the insistence of her children and their desire to see if Mouse, Bird and the rest of the characters in Blackberry Banquet really were right about the delicious nature of blackberries, the bush was spared (but it doesn’t sound like Mom was too thrilled ;-). In my mind, I envisioned Mom heading towards the bush with an axe, the children at her side, begging her to stop (yes, a bit like Fern trying to save poor Wilbur). For a sweet chuckle, and the full read, click HERE.